Random Lake, WI -- Badger Tag & Label Corporation, a printer of custom tags and labels, is celebrating their 75th year in business and as an expression of gratitude to their customers is offering a unique “sell”abration. September 4 marks the official incorporation date when Emil Thiel named the company Badger Tag Corporation. Throughout the month of September, anyone who places an order will automatically be placed in a drawing for a $75 credit on that order. A drawing will take place daily throughout September, Monday through Friday, which gives customers 21 opportunities to win. Based in Random Lake, Wisconsin, Badger Tag & Label is in the third generation of being a Thiel family owned, privately held business. Current president, Bob Thiel, guesstimated that “we’ve printed tens of millions of custom tags and labels since the company began.” Considering the challenges of today’s economy and similar historic fluctuations, that the company has flourished while many competitors have come and gone is a testament to the quality products and solid customer service they provide. In recognition of this accomplishment, Badger created a commemorative 75th anniversary logo that is being used throughout 2010. 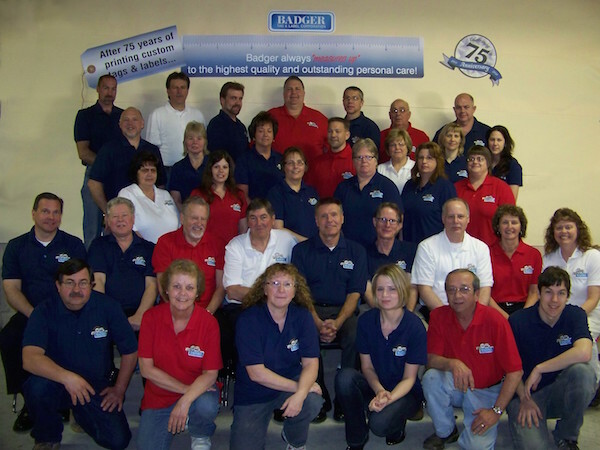 Employees are a key component of Badger’s success. One of the first annual company picnics was enjoyed by 11 employees. This year, when they celebrate with a special evening of dinner and entertainment, attending will be 35 employees, spouses, and numerous retirees. In an era when employee turnover is generally high, Badger has experienced the opposite: average length of employment is 20.6 years and almost half of the employees have been with the company over 25 years. In addition to the three staff salespeople who serve the Wisconsin and Illinois markets, Badger has some 500 independent dealers who cover the rest of the country. Technology and equipment have also played an important part in Badger’s success. In the 1960’s they installed one of the first ever built Webtron presses. In 2006 they expanded their capabilities to include printing of prime labels with the addition of a Mark Andy press. And, in 2009, they added short-run, specialty digital capabilities with the addition of a six-color UV inkjet press and plotter cutter. Today Badger owns their main production facility of almost 30,000 square feet and leases a second facility of 2,000 square feet. Badger Tag & Label Corporation produces tags and labels for customers throughout the nation. They print flexographic and letterpress methods on paper and synthetic stocks and deliver the finished pieces in singles, rolls, sheets, ganged, or fanfolded. They also produce short run and specialty projects with a UV digital press and plotter cutter. With a variety of finishing options, Badger provides a custom piece from initial design through final delivery. As part of Badger Tag & Label’s 75th anniversary, current employees, who are a key component of the company’s success, posed for recognition. To commemorate their 75th year of serving customers throughout the nation, Badger is offering a unique “sell”abration to all customers as an expression of gratitude. Throughout the month of September, anyone who places an order will automatically be placed in a drawing for a $75 credit on that order. A drawing will take place daily throughout September, Monday through Friday, which gives customers 21 opportunities to win. Badger Tag & Label, a printer of custom tags and labels, including short run and specialty projects, is in the third generation of being a Thiel family owned, privately held business. Current president, Bob Thiel, guesstimated that “we’ve printed tens of millions of custom tags and labels since the company began.” Considering the challenges of today’s economy and similar historic fluctuations, that the company has flourished while many competitors have come and gone is a testament to the quality products and solid customer service they provide. For more information, including submitting a project for a production estimate, call Badger Tag & Label at 1-800-331-4863, e-mail: sales@badgertag.com.